EmEditor Text Editor is a lightweight, yet extendable, easy-to-use text editor for Windows. EmEditor is very customizable, and it supports Unicode and powerful macros. EmEditor now supports very large files – up to 248 GB or 2.1 billion lines! In Professional version there are many new features including a Large File Controller, Vertical Selection Editing, Binary Editing, Optimized Search and Replace, improved Projects Plug-in, and many more! EmEditor is now able to open even larger than 248 GB by opening a portion of the file with the new custom bar – Large File Controller. The Large File Controller allows you to specify the beginning point, end point, and range of the file to be opened. It also allows you to stop the opening of the file and monitor the real size of the file and the size of the temporary disk available. The Unicode support is a must for anyone who uses international languages. Many text editors claim they support Unicode (UTF-7, UTF-8 and UTF-16), however, they only convert Unicode to the system encoding (or ANSI) internally when they open files, so they cannot actually edit characters that are not supported by the system encoding. For instance, many text editors cannot actually edit Shift-JIS (Japanese) encoding on English Windows. Most text editors cannot even open Unicode file names. EmEditor supports Unicode natively, and in fact, the whole program is built as a Unicode application. EmEditor allows you to open a file with any encoding supported in the Windows system, and you can easily convert from one encoding to another within EmEditor. EmEditor allows you to open Unicode file names, and allows you to search for Unicode characters. Since EmEditor supports Unicode characters even outside of the Basic Multilingual Plane (BMP), it can display the CJK Extension B characters as long as a supporting font is available on the system. With EmEditor plug-ins, EmEditor allows you to convert a selected text to HTML/XML Character Reference or Universal Character Names, and vice versa. 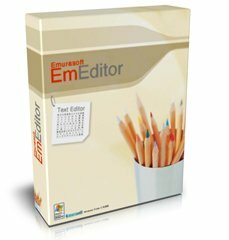 The following plug-ins are installed by default with EmEditor Professional.